“Rewind” will appear on the Hallucinogen EP next month. Today's Beats 1 World Record premiere was a new tune from Kelela titled "Rewind." The song is the third track on the singer's Hallucinogen EP. 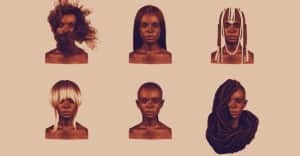 That project was originally slated for release earlier this year, but Kelela told New York Magazine in May, "It’s just not there yet, for me." She has since announce that EP will be out on October 9 via her own Cherry Coffee imprint (US) and Warp (Rest of World). The singer described Hallucinogen as "a departure from what you heard on the mixtape [Cut 4 Me]. It’s glossy, and it’s more hip-hop-based." "Rewind" is unabashedly pretty and propulsive, with some of the crisp textures of '80s pop. Listen now below. Arca and DJ Dahi also contributed to the EP. Read FADER's GEN F on Kelela.